Feet with radishes growing out of them. Naked female figures with mushroom and lamp heads. And color — lots of color. In “Morphed: A Senior Show About Bodily Transformation,” Amber Mateer merged diverse influences to explore identity and combination. 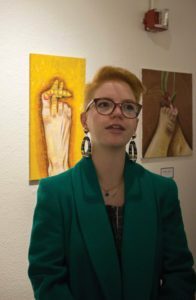 The exhibit was hosted in the Eduardo Carrillo Gallery on campus from Jan. 17-23. It consists of four series, each with its own designated section in the gallery. The paintings hang in chronological order of their creation, spanning the course of two years. On the farthest left wall Mateer displayed “Fungified, Part 1.” A gray torso of a woman facing away from the viewer is surrounded by black acrylic, giving the appearance of darkness. Two triangular, white capped mushrooms bud in place of a neck –– one from the chest, one from the top of the spine. Mateer depicts the human body at the forefront again in “Illuminated, Part 3.” At the painting’s center sits a gray-white female figure painted over a cobalt blue background. Her left arm cradles her lamp head while she stretches, as if mid yawn. Mateer’s “GMO’ed” series includes the most political work in the exhibit. “GMO’ed Part 1” calls out agricultural biotechnology corporation Monsanto for its unethical business practices. It depicts a large, beige wedge of Swiss cheese superimposed over an Easter egg yellow background. The nose protruding from the cheese wedge is tagged with the reverse date of the year Monsanto was founded, followed by a “B,” representing the billions of dollars pharmaceutical company Bayer spent on Monsanto’s acquisition. The “Rooted” series is displayed on the wall closest to the exhibit entrance. It features “Turmeric,” Mateer’s favorite piece. Mateer’s waxy white foot hovers over a golden, textured earthen background. From her rosy painted toenails grow ochre turmeric roots. Although Mateer created the show to highlight the appeal of the human figure and examine the social impact contemporary norms have on queer bodies, she is still hesitant to confine her art’s meaning to a single term. She prefers to give viewers room for their own interpretation. Visitors to the exhibit are drawn to Mateer’s work because of her bold color choice and the openness to interpretation her art space affords. Mateer explained her willingness to leave things open to interpretation stems from the flexibility and kindness with which she treats herself when she creates. She creates for the joy of creation and welcomes imperfection. “When people say they get frustrated with their art then I’m like ‘you’re doing it wrong.’ It shouldn’t be that way,” said Mateer. Driven by positive responses to the series, Mateer plans to continue making morphs until she feels satisfied with the medium. She plans to paint a monolithic art piece portraying produce-morphed bodies and continue her investigation into the subtleties of bodily transformation.